What is it like to participate on a national competition team? 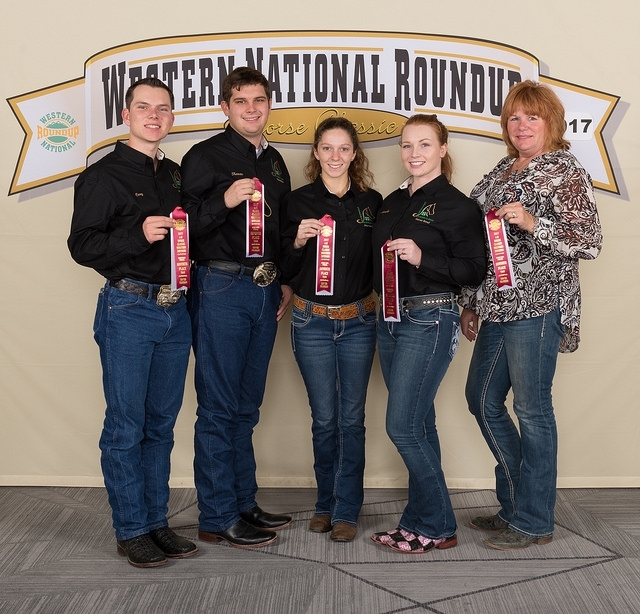 Find out through the experiences of 4-H'ers Thomas Aquino, Cory Carlson, and Emily Cullins - delegates who represented California 4-H at the Western National Roundup in Denver, Colorado in January, 2018. 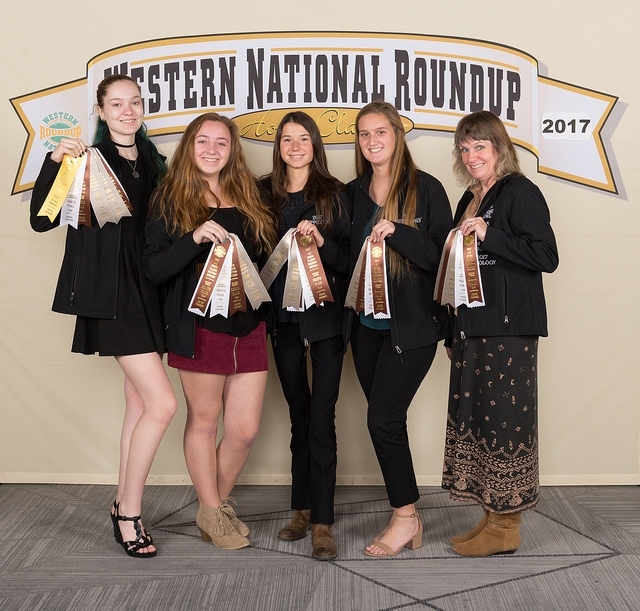 They qualified for the team by placing at the California 4-H Horse Classic event, which features a State Championship Horse Show and the Educational Contests. Registration is now open until June 4, 2018. Get more information and links to register on the Horse Classic event page. 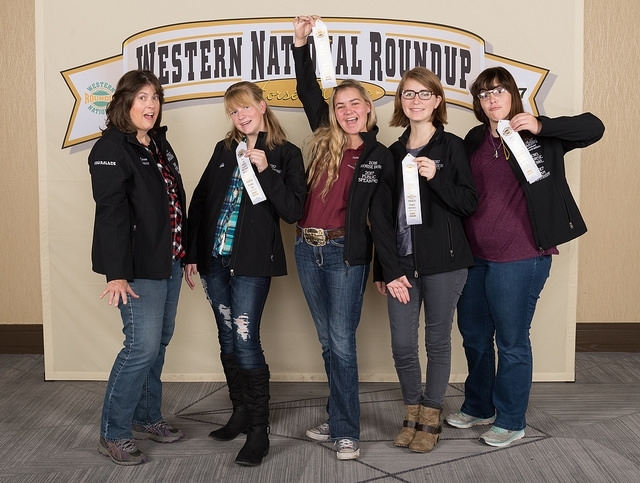 Very few things will get a group of teenagers up at 4:00am, but a 6:00am flight to Denver, Colorado for the Western National Roundup seemed to do the trick. This was my first time as a member of the State Team, and I was proud to be a part of California's 3rd overall ranking. We all studied hard, competed our best, and had a great time bonding. A contingent of us toured the Arabian Horse Association, where we were able to do research on a microfilm machine. We ate a lot of really good barbeque as we explored Colorado Springs, and spent an entire day at the Denver Stock Show. It was amazing to watch the ranch rodeo. The competitors were true everyday ranchers, showing what they do best! Of course, we also had our individual team events to compete in. As a member of the Horse Bowl Team, I can tell you that we studied a good portion of every evening to help us prepare for our event. Believe it or not, the studying never bothered me because I was learning about a topic that interests me and our team became pretty close knit over the months since [Horse] Classic. Although these events were exciting, I believe the highlight was meeting 4-H kids from across the country. At the dance and pin swap we were able to talk with teams from different states, and discuss our clubs and projects. It was nice to meet so many people from all over the U.S. (and even Canada) that shared my interests. Although I am aging out of 4-H this year, I am thankful to have had this experience. My only regret is not competing at classic until my final year in 4-H. So in closing—thank you, 4-H, for the friendships I have made from this National Competition, and for the memories I will always cherish. 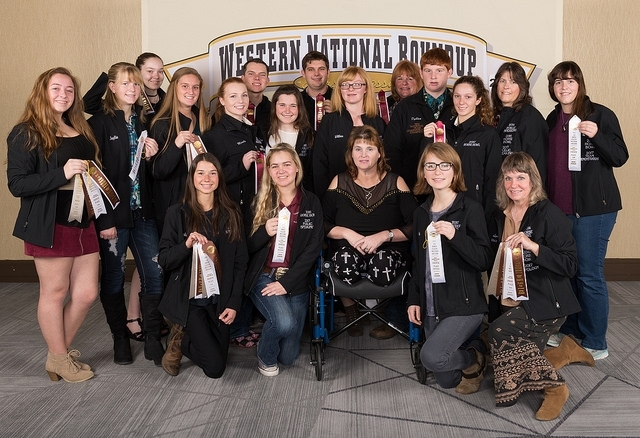 On January 4th myself and 3 other people went to the Denver, Colorado to represent California as the Horse Bowl team. In total there were 23 4-H members representing California there. The flight and the hotel room was all paid for by California 4-H. The night we arrived we had a guest speaker who talked about diversity and we met new people during this time from other states. The next day (the 5th) the Horse Bowl team and some other California 4-H members went to the Arabian Horse Association, where we got a tour of the building, saw cool awards and trophies and later went out to lunch with some of the personnel there. Later that night we went to the banquet and flag ceremony, where we got to see every state and Canadian province that was there. 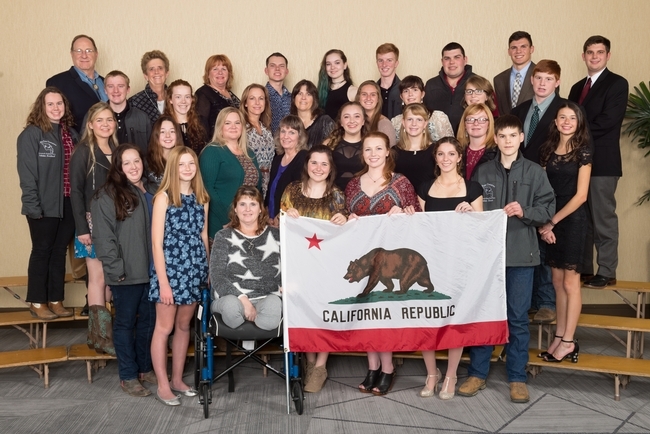 After the banquet,, we all took a group photo together to represent California and then most of California went to the dance that night where we learned new dances and met new people. On Saturday the horse bowl team competition we lost the first round but had high spirits to come back in the second round. The second round was very close in the first half with South Dakota having 5 and California having 4 but after the second half of the game things didn't go our way and we lost. We ended up receiving 7th overall as a team and even though we didn't win we were all glad to have come that far. After we competed we went to the Denver Western National Stock Show and saw all the livestock, vendors selling things, a llama show, and at the end of the night some of us got to watch the cowboy rodeo. Then we went back to the hotel and proceeded to do the pin swap with every state and Canadian province there. We got to meet a ton of cool people from different states and share stories. The pin swap was followed by a dance with a photo both and games. On Sunday, the last day we were there, we went to the award ceremony in the morning to see how everyone did. California ended up placing 3rd overall out of over 30 states who were there. Later that day after the ceremony we split up and some of us went to watch freestyle reining at the stock show and some of us went out to explore. We went to Texas Roadhouse [and] toured the rodeo hall of fame where we got to read about famous people and animals in the rodeo and see cool bucking and roping saddles. We also went to see the Valley of the Gods rock formations and climb them and admire them. On our way back home to the hotel we got to stop at Cabela's, which was my first time ever being there and it was an exciting experience. The next day we all went to the Denver Airport, where we said our goodbyes to each other. Overall it was an amazing trip and I was glad to have got to go and compete at the National Western Roundup. A wide audience stood before me, three judges and some of the most anxious looking parents. I had prepared months for this moment, I looked the part and I knew the words by heart. I opened my mouth and the words fell out with the utmost excitement. “The rankest of broncs….” It was the competition day for the 4-H National Western Round-up in Denver Colorado and I was there proudly representing California 4-H. But before this amazing moment could occur, I had spent countless hours with several different people rewriting and repeating my speech. I said my speech everywhere, from my 4-H county office, the car, Skandia and the airport. All in preparation of this day. My team, consisting of 16 youth and I, arrived at the Denver airport bright and early. When we stepped outside to get into our Uber, we were shocked by the cold. (It was only 40 degrees, but that's still cold) Once we got to the hotel we were greeted by warm smiles not only from the staff but also from all the other 4-H kids. The first night we had the orientation, we learned rules through funny skits and heard a wonderful speaker. Which only made us more excited for the events to come, we literally jumped from the conference room, sang and danced all the way back to our rooms. Whenever we saw different kids across the hall, we would shout “ Hey where are you from? Add us on Snapchat! What are you competing in?” We may have been a little loud but now I have a New Best Friend from South Dakota. 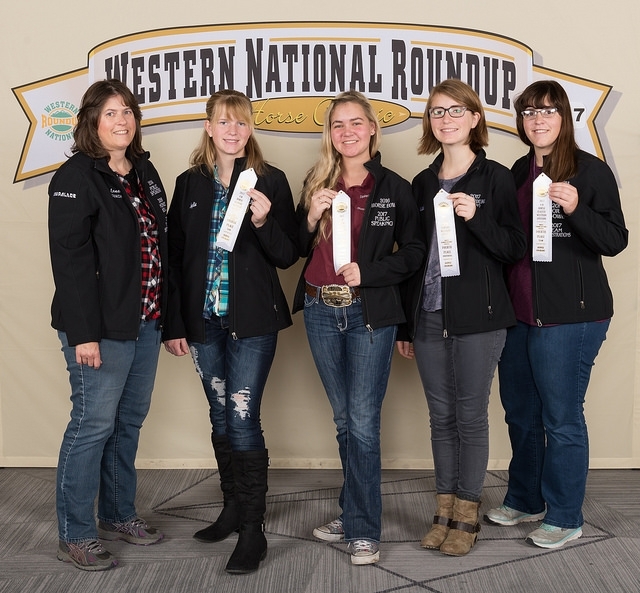 (It was -12 when they left for Colorado) The first morning, the Horse Judging team and Hippology team had their competitions. I wasn't there, but from what I've heard the competition was very difficult but they were confident [and] they did well. While they were away the Horse Bowl team and I were blessed enough to visit the Arabian Horse Headquarters. 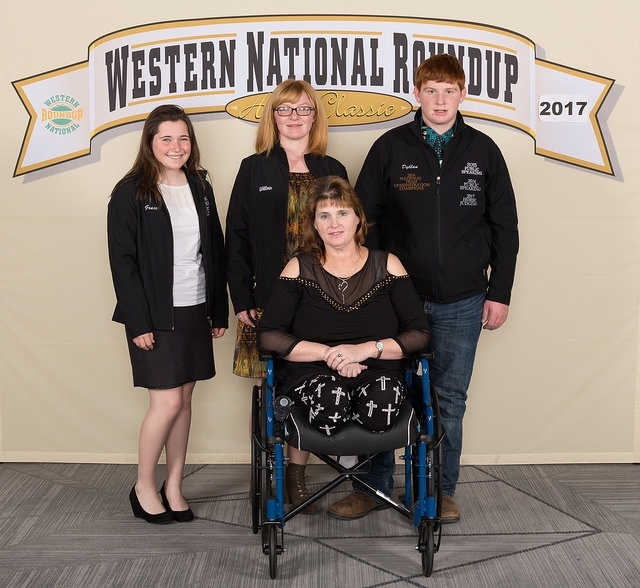 There we learned what it takes to put on a national competition: budgeting; how they register thousands of horses; how horse passports are made; and their marketing strategies. The people who run the Arabian Horse Association were so kind and just as excited to have us there as we were. Back at the ranch (hotel) the rest of the public speaking girls were saying their speeches. Just as I had, they prepared months for their 15 minutes in the limelight. Jayla and Mishayla gave a wildly entertaining demonstration on different horseshoes, while Mira gave a super fun and educational demonstration about horse cloning. They answered their questions with the utmost ease, making everyone from California proud. But, just like everyone else, they wouldn't know their placings until Sunday morning. Later that night when the competitions of the day were done, we changed into our nicest clothes and headed down the seven flights for the state pictures and dinner. I cannot emphasize this enough: the food was fantastic! Besides the wonderful food, the talented speaker shared his story of growing up in poverty, teaching us to not let ourselves be the victims of our circumstances, but to instead be our own hero. When all was said and done, we raced to the dance, where a Utah kid and I soon learned that I am terrible at Two Stepping. But all too soon, the coaches ushered us back to our rooms. The next morning was my big day, the day that I had been preparing for. Saturday morning the Horse Bowl kids and I woke super early. For them it was to get in a few more minutes of studying, while I, on the other hand, had to somehow manage to make myself presentable for my speech. When I was finally fully clothed and heading down the elevator, my coach drilled me with possible questions the judges may ask. I was nervous and stumbled through them. But come hell or high water, I still knew I was ready. Standing before the audience, I took a deep breath, smiled, and told the world what I knew by heart. 4-H kids. We did run into the little problem, of our California state pins not coming until Monday. (The day we would be leaving) But this didn't stop us from having fun, so a few kids and I came up with the solution of making our own! It took us five hours, but we enjoyed it. When the swap was over, we danced the night away (Sadly, my two-stepping had not gotten any better). The next morning, was the morning we were all anxiously waiting for. After eating the strange breakfast burritos, the awards began. First up was hippology, we were awarded with 8th, next was horse bowl with an exciting 8th as well. When it was the awards for public speaking, demonstration received a fantastic 4th, duo demo also received 4th. Then it was my turn, they announced 10th not me, my heart pounded, 7th still not me, finally they announced “In 4th place - California, Emily Cullins.” My team and I were so excited, we all started screaming - we screamed literally anytime California was mentioned—and the morning was not over yet. We were all overjoyed when California was mentioned 3rd high state overall. Which, of course, resulted in more screaming and hollering from us. We were a little rowdy, but it was so much fun. And just like that, the Nationals were over as fast as they had begun. This has been, and will always be one of my favorite 4-H events. I would definitely suggest anyone and everyone go and compete if they get the chance. They will come back with memories and new friends that will last a lifetime.